"What are you doing here, Lara?" Warner Bros has released the second trailer for the new Tomb Raider movie, based on the popular video game series about adventurer Lara Croft. This trailer is a bit better than the first one, thankfully, so fire it up and take a look. 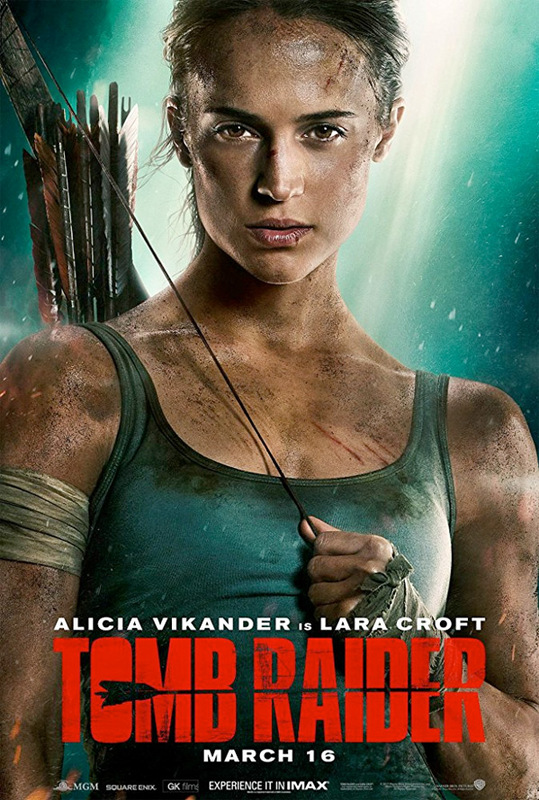 Swedish actress Alicia Vikander stars as Lara Croft, playing a young woman living in London who decides to travel to a mysterious island in an attempt to figure out what happened to her eccentric adventurer father. The cast includes Hannah John-Kamen, Walton Goggins, Dominic West, Daniel Wu, and Alexandre Willaume. This new trailer actually promises an entertaining movie, with some badass action and thrilling mystery. Yes, it's a big Hollywood movie but at least it doesn't seem like it's going to be a disaster. I'm honestly really looking forward to this now. Dive in. You can also still watch the first official trailer for Tomb Raider here, to see even more footage from this. Lara Croft is the fiercely independent daughter of an eccentric adventurer who vanished when she was young. Now a young woman, Lara navigates the chaotic streets of trendy East London as a bike courier. Determined to forge her own path, she refuses to take the reins of her father's global empire just as staunchly as she rejects the idea that he's truly gone. Advised to face the facts and move forward after seven years without him, even Lara can't understand what drives her to finally solve the puzzle of his mysterious death. Going explicitly against his final wishes, she leaves everything she knows behind in search of her dad's last-known destination: a fabled tomb on a mythical island that might be somewhere off the coast of Japan. But her mission will not be an easy one; just reaching the island will be extremely treacherous. Suddenly, the stakes couldn't be higher for Lara, who – against the odds and armed with only her sharp mind, blind faith and inherently stubborn spirit-must learn to push herself beyond her limits as she journeys into the unknown. Tomb Raider is directed by Norwegian filmmaker Roar Uthaug, of the films The Wave, Escape, Magic Silver, and Cold Prey previously. The screenplay is written by Geneva Robertson-Dworet. Warner Bros releases Tomb Raider in theaters everywhere starting March 16th, 2018.